I absolutely adore this image - and have done, for a long time. 5 of the pink ones and 2 white ones. It's a real spring flower. Infact, mine is peeping up from it's soily winter blanket as I type. I shall add some pics when it's grown and full. The hummingbirds are so lovely too. The image actually only comes with one hummingbird...the bigger one. it on the front of an anniversary card for my parents-in-law. Their anniversary is on 2nd April.. they had a springtime wedding! I decoupaged the larger hummingbird on 3d foam, to make it stand out a little. Vicky - this is a great card for an anniversary! HI What a beautiful card and the Hummingbird is so lovely. And your design is wonderful. And that you for joining us at Imagine that and good luck in the draw. Very pretty...like a breath of Spring air!! Thank you for joining us at Chocolate, Coffee & Cards for our 'Spring Is In The Air' challenge! Beautiful image which is very springy. Love the colors. Thanks for joining us in our "Spring" monthly challenge at Imagine That, Lisa Lynn DT. 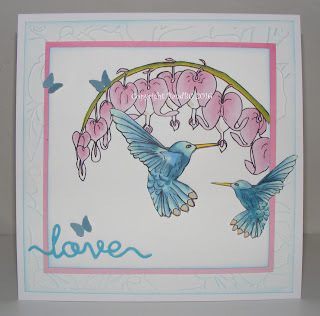 Thanks for joining our Anything goes challenge over at Crafty Friends. Superb card, loving your delicate colours ! I have also become your latest blog follower ! Beautiful card!!! Thanks so much for participating in our IMAGINE THAT! CREATIVE PLAYGROUND challenge!!! Can’t wait to see you participate again in our next challenge!! Have a great crafty day!!! 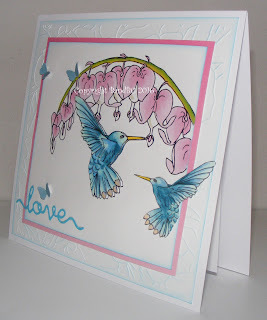 A gorgeous make thank you for entering it in our challenge anything goes at digi choosday. Love the CAS design and the soft pretty colors. That blue really stands out against the white.